valuable, thank you very much! Since I had no previous welding experience, your "welding basics" tutorial also helped me a lot. I was "brave" enough to go for round 50mm/47mm tubing in place of the square tube frame. It gave me grey hair before I mastered welding round thin walled tubing. Very difficult for a beginner, but a lot of practice helps (and a good grinder). Your instructions of how to make use of different existing bicycle parts were most welcome. It saved me a lot of research work. Since I live in a place with a lot of hills, and almost no flat areas, an electric motor is almost mandatory to get anywhere. So, I purchased a "Golden Pie" and 38V LiPo batteries. The trike was finished and first test ride was made today. It is NOT the right time for bicycle trips in Norway at this time of the year, but I cannot wait for the spring to get this thing tested. After some adjustments of the handlebars to maximum comfort, it was ready for a ride. It rides perfectly! Very stable and easy to handle. Even on ice and hard snow it was no other problems than some painful "bone rattling" over some very bumpy parts in the road caused by poor clearing of the snow and ice. The motor really does a great job to zoom up hills that otherwise would slow me to walking speed. I hope this will be a great alternative to my car when commuting to job, and for pure fun. Thank you very much for your instructive web site! Wow! 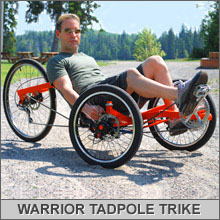 That's a great, rugged Warrior trike designed for your climate. Thanks, Bjorn for your kind words. Hope to see more bike creations from you. 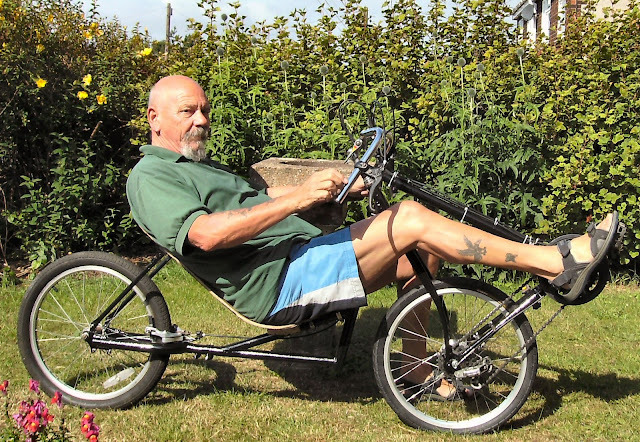 Build your own cool recumbent trike. "The bike is a small dirt jumping frame with (2) stage2 pocket bike engines rack mounted and V-belt driven. The wheel pulley is a same size rim hoop bonded and security bolted to the spoked wheel. Separate brake lever throttles. Approx 8-9 hp and 11000 rpms. Ridiculous acceleration from a dead stop or roll on. The video clip was shot during a mountain bike race near Pietermaritzburg, Kwazulu Natal, South Africa. A leaping antelope attacks the racer while he was in second place during the race. Apparently, the antelope and cyclist were ok after the incident, according to a BBC report. Good thing he was wearing a helmet. Imagine the head injury he would have sustained. 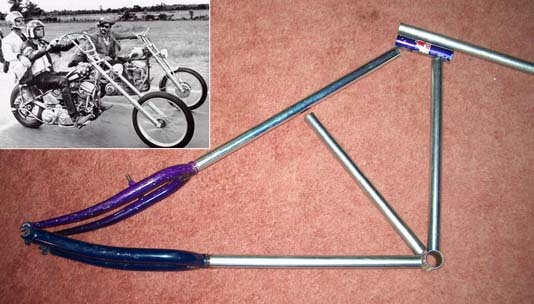 "My 1st bike project. During the summer months, I ride it everyday to the pool drawing many favorable comments! Kevin Johnston." 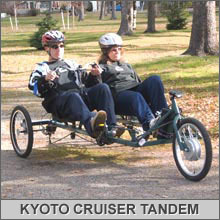 Build your own recumbents, choppers, tandems, trikes, ebikes, scooters and more. "Hey, I just wanted to submit a few pics of some bikes that I've built. I have to admit that your site inspired me to start building bikes in the first place. Thank you. Mike." Great work, Mike. You have a great collection of bikes. Thanks for sending them to us for the Builders Gallery. Hope to see more of your work soon. 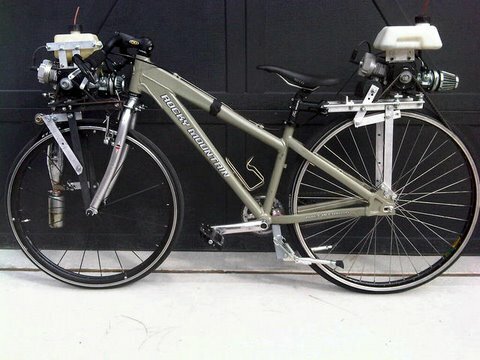 DIY bike plans - recumbents, choppers, tandems, trikes, ebikes, scooters, tallbikes and more. We had to do some maintenance, so if you tried to place an order and it failed, please try again. Everything is working fine now. Hopefully, the changes will result in fewer "Service Unavailable" messages on the AtomicZombie main site. It's been an ongoing issue that should be resolved now. 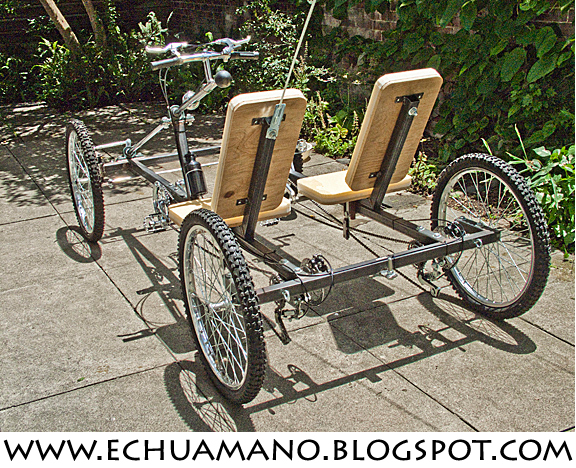 DIY bike plans: recumbents, choppers, tandems, trikes, trailers, ebikes, scooters and more! Highlander is a chopper based on those wild chops from the past - you know like the movie "Easy Rider"? Armed with nothing more than a photo from the move, a few bits of conduit and a hacksaw I began cutting things up and laying out the frame on the living room carpet - something you do when it's too cold to work in an unheated garage during the boring winter months. Highlander turned out so well, that it also earned a spot in my book under the chapter "The Infamous Chopper". 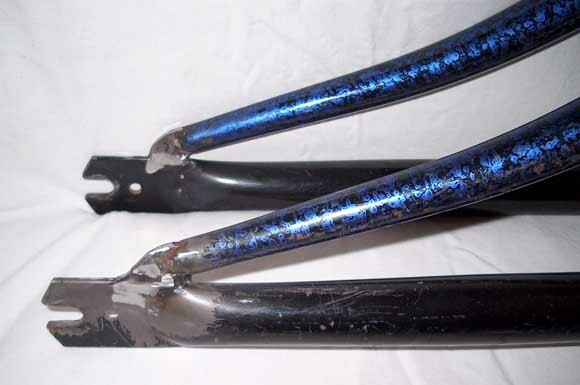 The rear of the frame is made by cutting the dropouts from one pair of front forks, then welding them another set . Both sets of forks are widened before hand in order to take a rear wheel - this is a delicate and precise operation that involves grunting like a rabid ape as you stand one one leg of the forks while pulling the other leg apart. Bottom bracket salvaged from an old BMX bike - a busy intersection where the chain stay tube, seat tube and down tubes all meet. 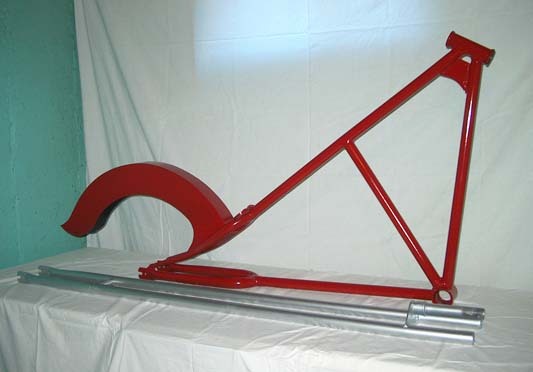 The entire frame is made from 1 inch thin walled electrical conduit. 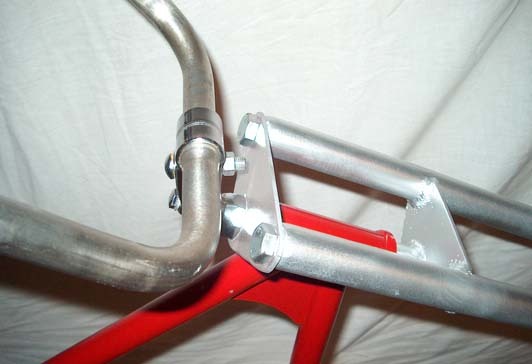 Gussets not only give the frame some character, but also add needed strength to the junction between the down tube and top tube. This area will be under a lot of stress due to the ridiculous angle of the head tube. 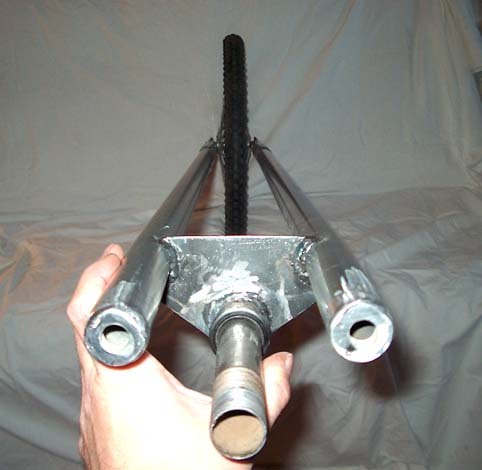 Four foot long chopper forks - made from 1 inch thin walled electrical conduit. 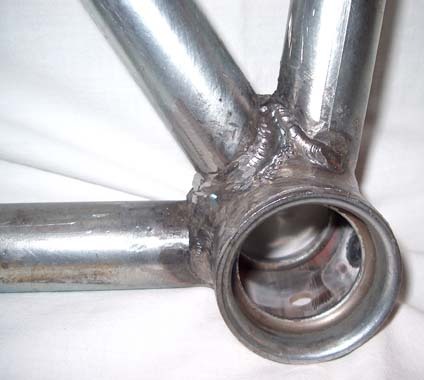 A nut is welded into the top end of each fork leg so that they can be bolted to the triple tree as you will soon see. 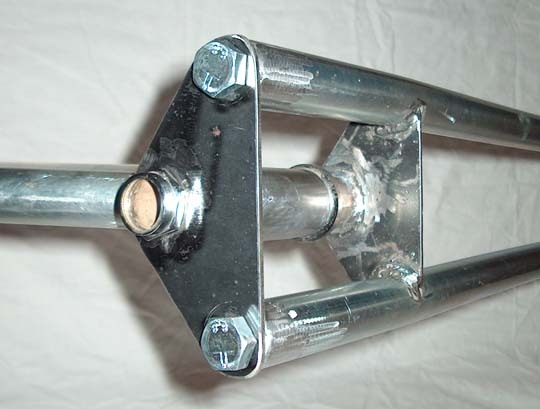 The two fork legs are welded directly to the bottom half of the triple tree. The threaded for tube is then welded to this plate. All of this is done with the front wheel in place to ensure proper alignment. The top of the triple tree is bolted to the tops of each fork leg and also held in place by the fork stem. This system is designed much like a typical motorcycle triple tree setup. Simple, yet effective. 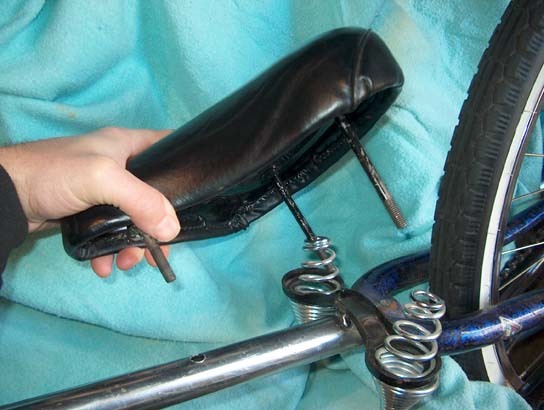 A big phat seat is mounted to the frame by welding the suspension part of the seat to the frame, then installing the seat back onto it. A big old exercise bike seat is a good candidate for this. You could also steal the seat from Grampa's old balloon tire cruiser - you know, the one buried deep in the back of the shed under the crates of 8-track tapes? What would a chopper be without a nice styling rear fender? Some thin sheet metal is used to cut out the three pieces that make up the rear fender. Just tie a marker to a string that is slightly longer then the radius of the rear wheel and tire, then draw out the shape. This metal can be cut with a jigsaw. The rear fender is tacked together and taking shape. 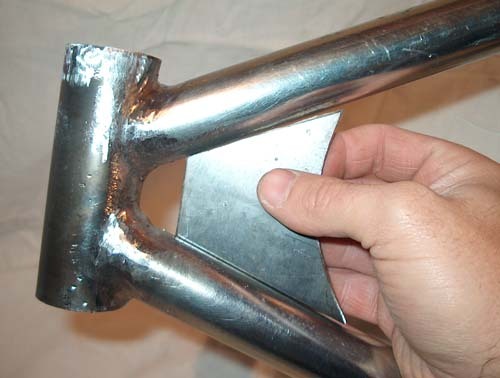 Later, the entire seam is welded and ground so that it looks perfectly smooth with no weld makes or blemishes. Patience! 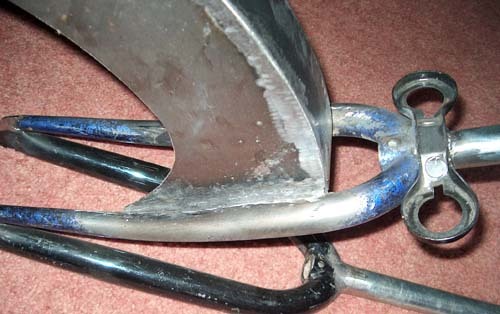 The rear fender is welded directly to the seat stays. Proper alignment is quite a chore, and the hammer flew across the garage in a fit of rage on more than one occasion before this step was complete! 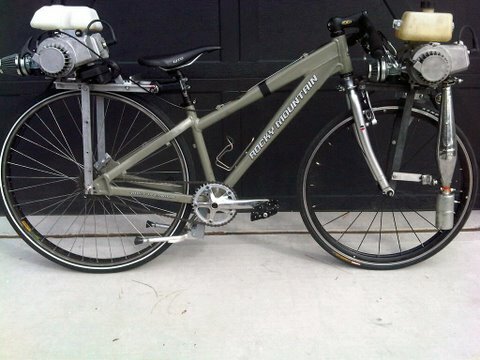 Once I had the fender welded to the frame, and the front forks completed, it was off the the paint shop. Nope, that's not a $500 dollar powder coat - its a $5 can of spray paint. An old-skool chopper must have a set of overly long ape hangers installed, or it would be breaking form. 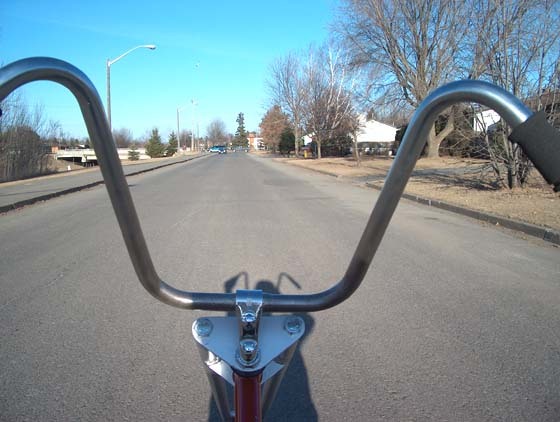 The handle bars are installed into a standard gooseneck just as they would be on a regular bike. Highlander is one Phat chop! Not bad for two days work and ten bucks worth of parts! The Highlander takes some getting used to, but rides well once you get the hang of it. The reclined position is actually quite comfortable, but don't ever admit that to anyone - choppers are supposed to be painful and hard to ride! Yes, on a chopper like the Highlander, you do own the road! More interesting statistics and information about work related stress, disease and death. Worth reading. 3 in 4 workers believe job stress has increased over the last generation"
"We may accuse each other of exaggerating when we say our jobs are killing us, but it might not be that much of an exaggeration. Dozens of studies over the years have linked job stress to increased incidences of disease and death. With this infographic, discover who is most at risk, what causes workplace stress, what the likely consequences are and how both employers and employees can reduce the problem. Who Is At Greatest Risk for Work-Related Stress Death? Kazumi is a very talented guy. His blog has drawings, pictures and videos of his many projects. "cosas que hago con las manos" = things I do with my hands. And, he designs homes, too. "There's tantalizing data suggesting that biking could go a long way to solving America's obesity crisis. And much more. Obviously, correlation isn't causation, but given how much weight you lose by riding to work, the data is pretty compelling. Then again, could Americans really commit to the cultural shift that biking all the time entails? After all, it's not like our gas prices are going up to $8 a gallon, as they are in Europe where gas taxes are huge. If you're trying to fight cars as an American politician, you'll be out of work fast. Especially since, as of this moment, only a tiny .6% of all errands and trips in this country are made via bikes. There are suggestions that the government takes this trend serious: Transportation Secretary Ray LaHood has been making noises about making biking easier and safer across the country. But nonetheless, the degree to which motorists seem to despise those on bikes is pretty amazing--in New York's own fights over bike lanes, the backlash has been vicious. How do you make cyclists safer without making drivers feel like they're under attack? The answer to that question could hold the key to our biking future. 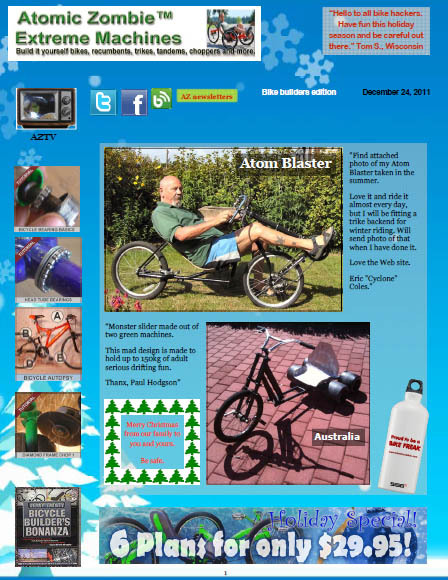 "Find attached photo of my Atom Blaster taken in the summer. 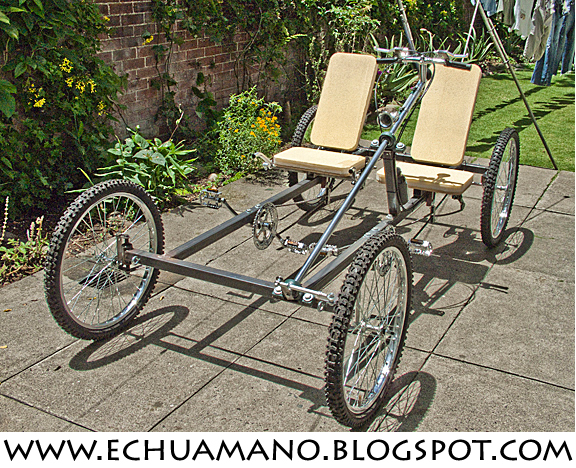 Love it and ride it almost every day, but I will be fitting a trike backend for winter riding. Will send photo of that when I have done it. 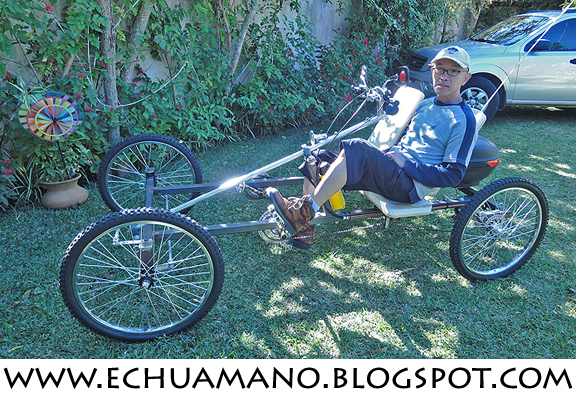 Great recumbent, Eric! 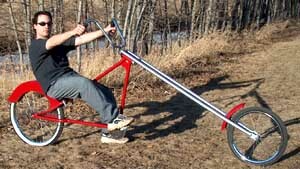 Definitely take some pictures when you convert it to a trike and we'll add it to the gallery, too. Thanks. 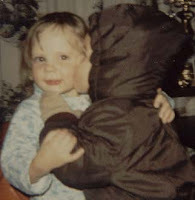 We are bike builders, co-authors and childhood friends - known as KoolKat and Radical Brad on the AZ Builders Forum - located in Ontario, Canada. Brad Graham has been building his own custom bikes for over 25 years. We launched Atomic Zombie Extreme Machines over 10 years ago to showcase some of his creations, and it has grown ever since. We (Kat and Brad) design and publish DIY plans. The AtomicZombie site also has an extensive Builders Gallery and international Builders Forum. Our DIY plans detail every aspect of the building process using easy-to-follow instructions, high resolution pictures and diagrams. Even if this is your first attempt at building a bike, you will be able to follow our plans, as no previous expertise is assumed. 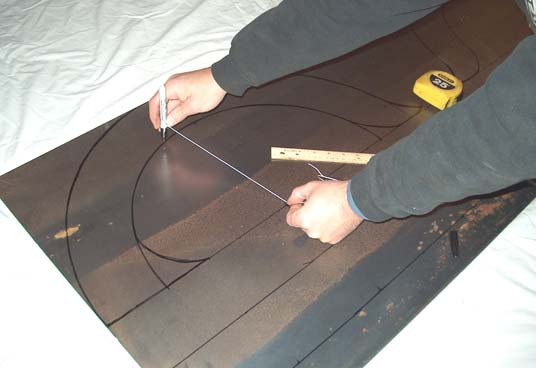 Real photos of the project and detailed diagrams are used instead of complex drawings, so you will not have to guess when critical measurements are required. You will only need a minimal set of common hardware store tools to build any of our plans such as a welder, angle grinder and hand drill. To ensure that anyone can follow our plans, all welding was done with a basic AC stick welder, and the only other power tools used are an angle grinder and hand held drill. 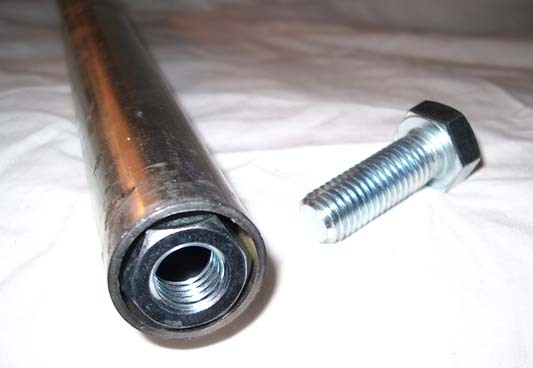 Although some of the trikes require a small threaded part to be machined, drawings are given and the costs are normally very minimal at most machine shops. No difficult-to-find or non-standard bicycle parts are used in Atomic Zombie Extreme Machines plans, so you can acquire parts at most bicycle shops, thrift stores, or even scrap yards. Our plans allow a great deal of modification as well, so you can adapt your project to the parts you have available, or easily add your own modifications to suit your individual needs and style. Most of the amazing bikes and trikes shown in our gallery were built by those who never considered taking apart a bicycle or turning on a welder. 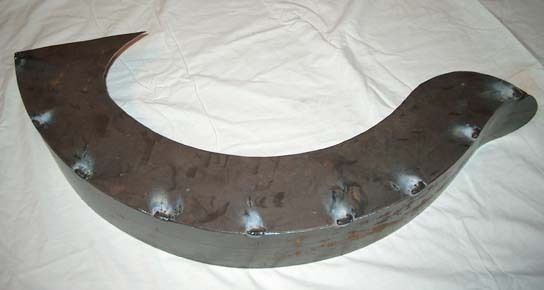 With a little patience and a few days of practice, you can learn to weld steel and turn scrap metal into a work of art. Our Builders Forum is a great place for new builders to share ideas and seek help when first starting into this great hobby. Membership is free, so join us! The Builders Forum represents an international community of creative people who enjoy building their own cool stuff! Our forum is family safe, meaning that we keep it clean and free from flaming, offensive language and trolling. If you want to talk about the things you are building and meet others who share your desires to create, then please drop by and join the discussions! 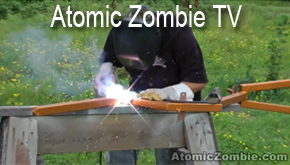 We also encourage experienced builders who have completed projects based on Atomic Zombie plans to help other novice builders, so feel free to share your advice, tips and tricks with the community. 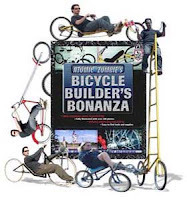 In 2003, Brad Graham, inventor, bicycle creator and author received a Guinness World Record for the World’s Tallest Rideable Bicycle, a new category. It was a dream for Brad, who has always wanted to be in the World Record book. 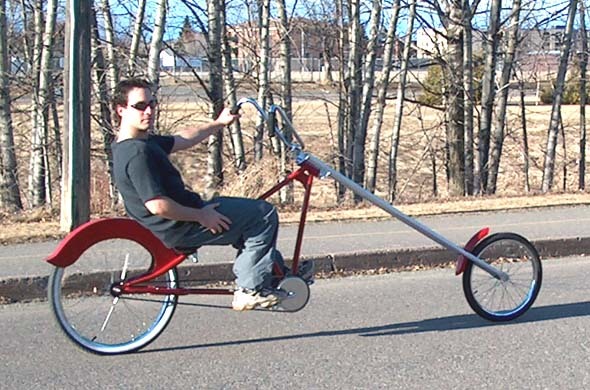 On July 1 at 1:04 p.m. (ET), Brad launched his first successful ride on his 14-foot, 3-inch high SkyCycle bicycle around the Thunder Bay Community Auditorium parking lot to cheers and applause by family, friends and bystanders. Brad is known internationally for his Atomiczombie.com web site, which inspired the 2003 Atomic Zombie’s Bicycle Builder’s Bonanza book. 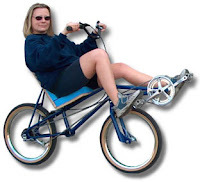 Kathy McGowan is also a bicycle enthusiast, co-author of Atomic Zombie’s Bicycle Builder’s Bonanza, and proud owner of several custom built recumbent bikes. Additionally, Kathy coordinates the logistics and marketing aspects of many bicycle, robotics, computer and publishing projects, manages the daily operations of the couple’s multimedia adventures, including Atomic Zombie, and co-ordinates various marketing and communications initiatives. 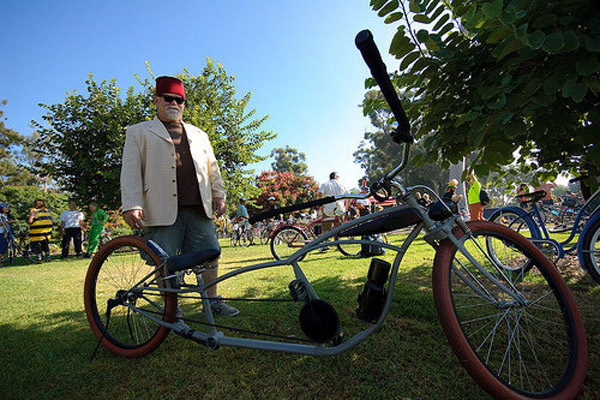 Check out thousands of custom bikes in the Atomic Zombie gallery, and be sure to send us a picture of your completed homebuilt recumbent, chopper, tandem, trike, ebike, tallbike, trailer, etc., to add you to our growing AZ Krew community of bike builders. Cheers, friends. Great bike, Harley. Thanks for sharing (love the Fez, too! ).